"I purchased Horizon for my MR, its an awesome machine." In Texas, everything seems large. This was true at Cypress-Fairbanks Medical Center in Houston, where the MRI Department was using a "monster" film-only imager to print exams onto film. That changed when Angelic McDonald, the MRI supervisor, discovered the Codonics Horizon Ci Multi-media Dry Medical Imager. After lobbying to acquire the system and then receiving administrative approval to do so, "small" was suddenly back in style. Weighing just 66 pounds, the Horizon's small footprint enables it to be installed virtually anywhere within a department. However, its small size can be misleading - Horizon's superior, diagnostic image quality is larger than life, far better than that of its "monster" predecessor at Cypress-Fairbanks. "It's huge - almost the size of a car," McDonald said of the original imager, which is still used by the CT Department. "It takes up the whole width of our film library." That's not the primary reason the Codonics imager was acquired to replace it. Recently, the MRI Department purchased a number of high-end MRI software packages designed to enhance its high-field MRI system. Despite that significant investment, the existing imager simply couldn't present the images well. "I resorted to printing them out on a regular paper printer in an office," McDonald said. "The color was coming out very drab, not brilliant like I see the images at the workstation. The way we were presenting them to our referring physicians did not do our images justice. We spent all this money on technology for these studies, but we were displaying them as if they were done with crayons." It came down to this: "If I could print high-resolution images in beautiful colors, give them to the physicians, and they could see them right smack in front of their faces, you can't get hit upside of the head any better than that. It was everything about the printer - the high-resolution film images, the grayscale paper and the color - that sold me. Why should I have a tech spend valuable time at a workstation if their work is not appreciated on the final product?" With that in mind, McDonald went to work. An applications specialist tipped her off to "a really good imager." McDonald contacted a Codonics sales representative, who brought out a Horizon Ci for an on-site demonstration, trained her to use it and then left with the machine in tow. The rep's departure gave McDonald time to ponder. She discussed the imager with radiologists, including George J. Abdo, M.D., the medical director for radiology and president of Houston Northwest Radiology Associates. She compared Horizon images with what they were used to seeing and presented Horizon and the side-by-side images to administrators for approval. The demo and data made the decision to buy very easy. In fact, two more purchases are expected during the coming year. "We're fixing to put in a PACS system, but you still have to print with PACS," she said. "If you're PACS, the most economical way to print is using Codonics' grayscale paper. Why pay for film that has to be recycled when you can use paper?" Using the high-end Horizon Ci, flawless images can be presented on clear and blue film, grayscale paper and color paper in a variety of sizes. Additionally, imagers hold up to 300 sheets of film or paper, can be placed anywhere within a clinical department and offer the fastest time-to-first print. 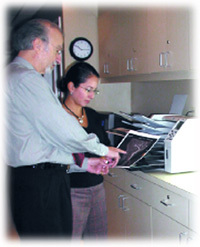 In the Cypress-Fairbanks MRI Department, several different media are used: Codonics DirectVista 14- by 17-inch grayscale paper, and letter-sized ChromaVista color and DirectVista grayscale paper. While the grayscale presentation is impressive, it's the color that raises eyebrows around the hospital. According to McDonald, Horizon presents virtually all MRI exams extremely well. However, she especially appreciates printing out MRA exams. "The renal and carotid arteries look extremely good using the system," she said. "When I do shaded surface or volume rendering, Horizon is outstanding. When any fusing of dynamics is done, again Horizon is excellent, because we can colorize and better appreciate what we're seeing. And, with the heart we can see wall motion." "I'm most impressed with the vascular studies - head, neck, kidneys," he said. "When the doctors are talking with their patients and giving them options, it's nice to have a picture to show them. I really like it." The system enables clinicians to effectively present certain exams that other systems cannot. One is the MR urogram, which McDonald believes cannot be presented well using any other dry imager. "We take the data we receive to our post-processing station and colorize it," she said. "The kidneys get a color, the arteries get another color and the ureter and bladder get a color as well. Then, we fuse the information to see how all these different systems interact. Even the patient walking out can appreciate the time spent on the scanner." So can surgeons. According to McDonald, physicians are bringing the images right into the operating room, in some cases taping them to IV poles where they can easily see them while operating. Often, those same patients have been shown their images beforehand, enabling them to better understand the upcoming procedure. "Some of these MRI procedures are extremely expensive," McDonald said. "Patients appreciate the money they've spent when they can get something tangible for it. And, an educated patient is always easier to work with." She added, "Patients who leave with something to show for their time in the magnet and the money they've spent are more likely to come back, too." To that end, Horizon has enabled the department to retain patients. Equally important, it has helped the department reign in several new referrers in the short time since its installation. "We gained two new urologists during the first week just by walking down to their offices and showing them the pictures from MR urograms," McDonald said. "They said, 'I order these exams all the time, but I don't get pictures like this.' We expect to get more referrers such as these as time goes by." According to McDonald, each urogram requires two procedures, and both urologists are expected to send the department two urograms each - a total of eight exams - per month. McDonald expects revenues resulting from the use of Horizon to increase significantly during the first year. "People now appreciate what we were already doing," she said. "I didn't buy another MR coil, just an imager. It's an awesome machine."